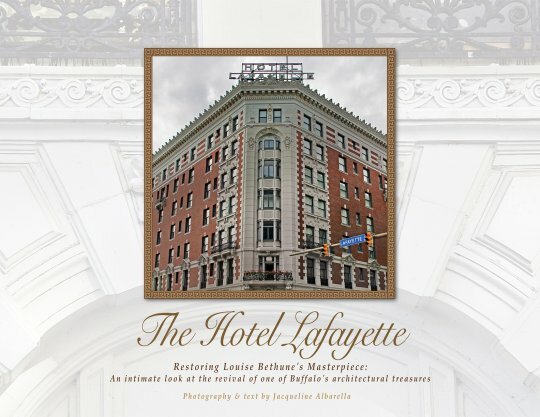 The Hotel Lafayette: Restoring Louise Bethune's Masterpiece dramatically captures the energy and excitement surrounding this momentous event in the rebirth of one of Buffalo's true landmarks. Jacqueline Albarella's book is a splendid and memorable tribute to a gem of Buffalo's past and future. Here is a book written about a Buffalo landmark, by a Buffalo native and was printed in Buffalo, NY. This stunning full-color 80-page softcover book includes more than 150 photographs that chronicle the restoration of this downtown icon. Western New York Wares Inc. is proud to be the distributor of a new regional book that focuses on one of Western New York's most publicized historic restoration projects. The Hotel Lafayette: Restoring Louise Bethune's Masterpiece is a stunning full-color softcover book that vividly chronicles the restoration of a famous downtown building. The Hotel Lafayette recently reopened as a multi-purpose facility and has been an early success. The 80-page softcover book (8 1/2" x 11") has more than 150 photographs (both vintage images and photos of the restoration).